Phew, this one is a beast. I’ve been working on this makeup off and on all summer and it kinda grew out of control as most of my projects do. But it’s finally here and I’m pretty pleased with how it turned out and hope you all like it! It’s a bit more expensive than my usual offerings but you get a TON of stuff. Also, the makeup colors look great on very light and very dark skin tones and most everything in between! 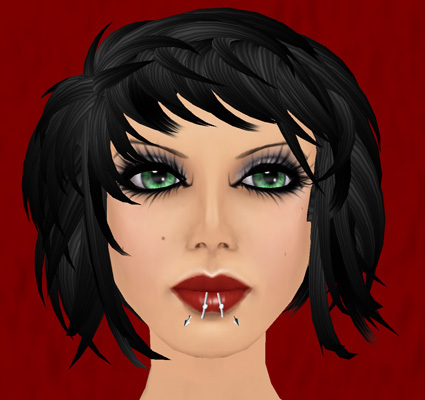 Annnd, if you have a LAQ head you can mix and match because LAQ’s heads support multiple tattoo layers! Let me know if there are other heads out there with that capability as LAQ is the only one I own that does. On to the details! Available now in my main store and on the marketplace! Just a little crosspost from my store blog and some shameless self promotion. 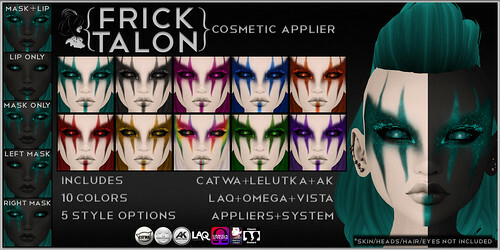 You can find some Frick newness at The Bacchanal at the Love/Hate HQ here: http://slurl.com/secondlife/MudHoney/212/232/499 until July 3rd! I went a bit nuts at Miriel. And I’m already planning a return trip because I need some red/orange eyes to add to my collection. On a semi-related note, did you know that eyes are the most mentioned body part in most genres of music? Hands were next on the list. I rather like music that mentions those two parts in a very odd or creepy way which has nothing to do with romance or love. So I have a thing for eyes…you know, in addition to my thing for hair and clothes. :P I’m fairly picky though when it comes to eyes because I have fairly large anime sized eyes in SL so most eyes tend to be on the itty bitty teeny weeny side so they look.. odd. I love my eyes from Glanz because they come in a large size but as gorgeous as they are, they don’t come in a wild array of colors so I’ve had to keep shopping around for weirder colors. I specifically had gone in search of some red eyes to use with my Drow skins so I hopped over to OnRez and did a bit of browsing. I came across these eyes from Happa and I have to say, they are lovely. I ended up going for the pack of 11 eyes for L$ 250 and I am very pleased. The price is right and the eyes are gorgeous. One thing I really liked about the eyes is that when your eyes inevitably roll back into your head these eyes are elongated so you don’t get a huge expanse of eye white. Each pair of eyes comes with 2 pupil sizes, large and normal. I opted for the large pupil size and I love the look. The individual colors are only available on OnRez but you can find the full pack as well as a demo in world. Yay for new eyes! Oh and view the picture large to really see it. I change my eyes in Second Life the way I do my hair, clothes, skins, etc. That is to say, several times a day. I’m also a lemming. I will follow someone with something cool off a cliff any day. 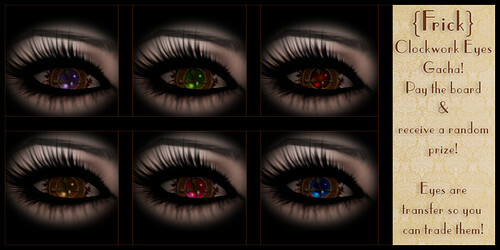 I’ve been lemming eyes from Glanz ever since I saw them on Sai Pennell’s blog. I debated, and I debated. $300L for a pair of eyes is pretty freakin’ steep imho. But I finally couldn’t resist the pull any longer and gave into my lemming urges. And well, I have no regrets. No srsly.. no regrets. They are really, really pretty. Best of all is that, even from far away, you can see the color of my eyes. I went with the green since they seemed to be the brightest color out of the ones available.